Sea World killer whales, baby marine creatures and new sea lion show are some of the exciting things going on at San Diego's Sea World. Part education, part entertainment/amusement fun, Sea World provides a day of action-packed color and thrills along San Diego's beautiful waterfront. It's an adventure you won't want to miss. Shamu the killer whale, a long time resident of Sea World jumps through the hoops in Shamu Stadium with his "Shamu Adventure" show. But don't miss Clyde and Seamore, two sea lions with too much time on their hands in "Fools with Tools". The sea lion and otter stadium was transformed into a a colorful studio type setting. As you enter, you become part of the live studio audience as Clyde, Seamore and their buddy, Ace, star in their own home repair show. 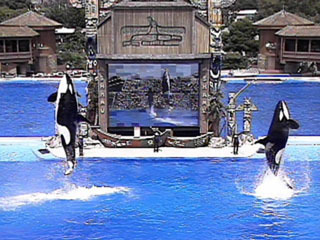 Restaurants, shops and amusements plus guest visits from a character Shamu are included in a day's admission. The Garden of Discovery has a butterfly, bee and bird garden. Wild Arctic offers a simulated jet helicopter ride before touching down in an Arctic environment with polar bears, walruses, beluga whales and seals. Shark Encounter, Otter Outlook, Dolphin Bay and Shipwreck Rapids water ride make this day a splashing success for kids and adults. Click here to make a booking or inquiry for this tour!